Are you thinking about the Apple Watch? Wait, let me start at the beginning. 1997 was a vastly different time. Yes, email had been around for a while (I had my first email account at university in 1990) but the Internet wasn’t anything like the all-pervading force it is today. I accessed the Internet via a dial-up modem (which stopped other people in the house from using the telephone). I used it mainly to access bulletin boards like CiX, since the World Wide Web was in its infancy. I wouldn’t make my first purchase on Amazon until October 1998. I wouldn’t upload my first website until 1999. Paypal was a year away. YouTube was eight years away. Public access to Facebook was nine years away. Twitter was inconceivable. And my first mobile phone looked something like this. 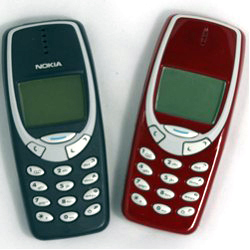 The battery life was pretty good, and it made phone calls and sent new things called SMSes or “text messages”. Mobile phones had only recently stopped being the preserve of yuppies and had also recently stopped being the size (and weight) of housebricks. They were fairly expensive to own and to use, however, and so my wife and I ended up sharing this one. It wasn’t until 2000 that I finally got my own, which by now looked something like this. It was also in 2000 that I bought a PDA (personal digital assistant) for the first time. I’d been tempted by a Psion Organiser in the 1980s but I couldn’t afford one that was actually any good. By now, Psion was in decline and Palm was the new market leader. Palm had introduced the original Palm Pilot in 1996. This digital calendar, phone book, eBook reader, notepad and calculator used a stylus to enter data via a simplified alphabet called Graffiti, but early models – although impressive for the time – were very expensive. When Palm released the Palm m100, I had to have it. It cost around a hundred quid, was powered by two AAA batteries and it had to be synced to a computer to get updated information on to it (a service called AvantGo synced and cached stripped-down web-pages for later reading on-the-go). It rapidly took over my life. Over time, I went through several generations of Palms, culminating in the Palm Tungsten TX which finally got rid of the dedicated Graffiti area (which accepted input from the stylus but which couldn’t display anything), had a colour screen (320×480) and Wi-Fi – but still no cellular connectivity. I got mine around 2006 and its vibrant app development community meant there was precious little it couldn’t do. I still had a mobile phone at this point which by now looked something like this. For a while, I had an MP3 player as well but later Palms which accepted SD cards eventually took over this role. Why so many devices? Obviously, I knew that objects existed which combined the functions of phone and PDA into a single device, but Palm Treos and Compaq iPAQs seemed somehow clunky to me, certainly physically if not in terms of software, and I’d got really used to my Sony Ericsson and my Palm Tungsten and didn’t really see a compelling reason to drop either. I’d also stopped using Apple products since giving up being a graphic designer. At one point my desk at work had a Mac for Photoshop and QuarkXPress and a Windows PC for coding and I was running both of them off one giant monitor. Now, I was working from home and I’d scaled my home computer down to a laptop and relegated my Windows PC to the role of media centre. I’d played with iMacs and been impressed at how pretty they were, but Apple was a niche player as far as I could see, and I wasn’t in that niche. It’s worth pausing just for a moment here to look at where Palm stood at this point. They were the market leaders in PDAs, largely because of the enormous variety of apps available. Even as far back as 2000, usability guru Jakob Neilsen had noted that what he called the “deck of cards form-factor” was far superior to the “candy bar” format of most “feature phones”. Palm was surely poised to dominate the fast-approaching smartphone revolution. Weren’t they? Well, I might not have been using Apple products regularly, but I certainly sat up and took notice when Beaming Steve unveiled the original iPhone in June 2007. Clearly this was an amazing device, but as someone who’d never even owned an iPod, I didn’t have any brand loyalty to Apple and all I could see were the flaws. No 3G, which meant sluggish Internet, and you couldn’t surf and talk at the same time. No apps, so you couldn’t find nifty new software like I could on my Palm. No expandable storage. And – ouch – that price! When O2 announced it for sale to UK consumers in November, I just continued with my Wi-Fi Palm Tungsten and my T-Mobile Sony Ericsson candy bar phone. However, when the far cheaper iPod Touch was announced in 2007, I was suddenly convinced, and got Deborah to buy me one in the States where she was visiting friends and send it home to me. I abandoned my Palm, downloaded iTunes and bought a bunch of CDs to rip in order to use it to its fullest. Suddenly my crummy Tungsten with its fiddly stylus seemed like Stone Age technology. But worse was to come for Palm. Also, in 2007, Palm announced what amounted to a new category of devices – the Palm Foleo. This amazingly small and light personal computer had a full-sized keyboard and a 10 inch screen. Today we’d say it looks a little like a netbook and a little like a Microsoft Surface. What it didn’t have was 3G connectivity, but you could pair it with your Treo and download email on the go. Apple should have been worried. Blackberry – who owned corporate-email-on-the-go at this point – should have been worried. But if you’re wondering why you never saw any of these Foleos in the wild, it’s because three months after announcing it – and before it had shipped a single unit – Palm cancelled the project altogether. From there, Palm spiralled into take-overs, functional divisions and ultimately irrelevancy as Apple seized the initiative. When the refreshingly affordable iPhone 3G was announced in 2008, I needed no more persuading. My iPod Touch had become invaluable. I had “jailbroken” it so I could install apps, I was subscribing to a bunch of podcasts and listening to audio books, and I was sick of having to try and find Wi-Fi hotspots before I could check my email or browse the web. I paid off T-Mobile, abandoned my Sony Ericsson candybar phone and I was all-in with Apple. And when it is finally available, what do I want? Previously, it was an easy choice (“the black one with the most storage, please,”) but this is a fashion accessory and Apple has provided a bewildering array of possible options. My skinny wrist probably means the 38mm model is the one to go for (even though that means fewer pixels, not just a physically smaller screen). I would ideally like the Black Stainless Steel model with the Link Bracelet, but I’m not paying £700 for the privilege. If the Watch Sport range is the only one which is remotely affordable, then I guess it will have to be the Space Grey Aluminium with Black Fluroelastomer band. The 18 carat gold models are clearly meant only for demented millionaires, in which category I do not alas qualify – some estimates put the price as high as $20,000! And if it is US only, I may be looking into one of those services which provides you with a US postal address and then ships the goods on to you. I’ll let you know how I get on.